January | 2012 | Can Men Cook? Meeting up with a colleague, who is a travel writer. Murray Stewart and I went on a course run by Judi Godwin on how to write articles for newspapers and magazines. It was great fun – a whole week with many people on the verge of breaking down – thank goodness for the bar after the daily grind! 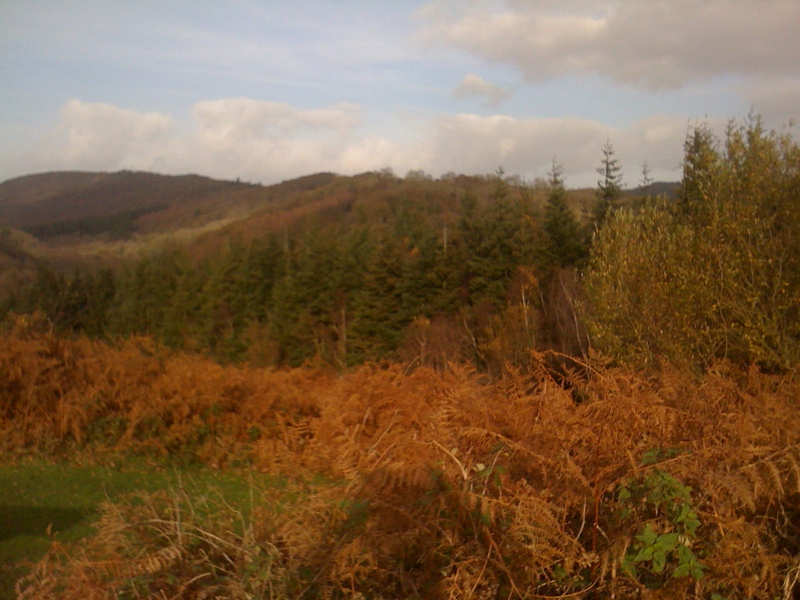 Here’s an example of Murray’s travel writing – pretty darn good, I think you’ll agree? We met in a pub in the middle of the High Street in Old Amersham. It is a real pub, which would have lots of smokers still if we hadn’t decided to change legislation. It’s that style. Loads of drinkers, even at lunch. And lots eating good solid fuel and food! Have you noticed that some things seem good value and some overpriced even on the same menu? This is all about ‘specials’ – and the time and effort to make things. There is a lot of effort in sandwiches – well, to do them right anyway. You can only do fresh. the best places now do a chip garnish as well as a few tasty healthy bits. Look, you can leave them if you don’t like them. But a few chips – what’s not to love? At a fiver, I was tempted. But then I spotted pork loin chops with Apple Mash and vegetables. I was not only intrigued by the Apple Mash, but also by the bargain price of £7.25. An interlude – here’s Murray’s gorgeous old Citroen DS which always looks so futuristic to me. 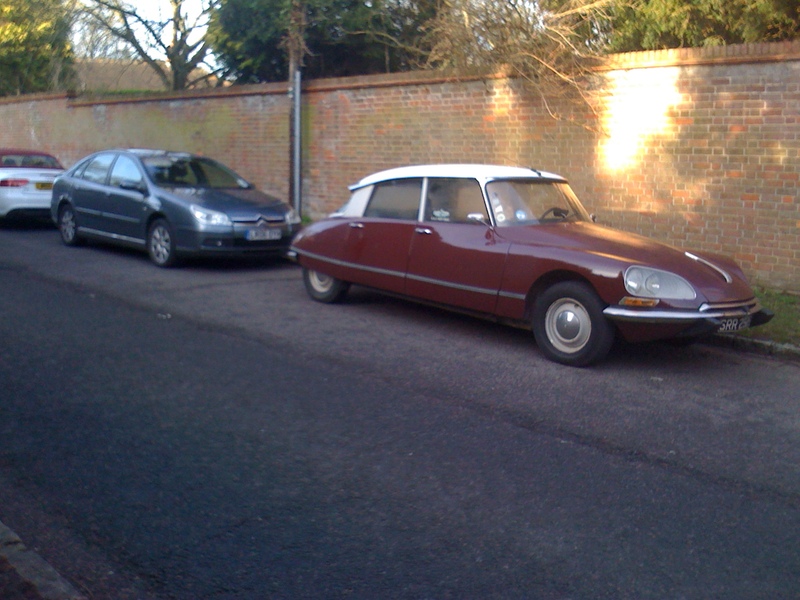 And it’s parked in front of my Citroen C5, which is the great-grandson of the beautifully designed DS. Apple Mash? Funny – a mound of spuds with the top lopped off – like a boiled egg. Then the hole filled with some very tart apple sauce, and the spud hat put back on again. What fun! It actually worked. And a bit of excitement with lovely gravy, and a good mix of veg. OK – they were probably all bought in and reheated (how the hell would they make money otherwise?) but I really enjoyed it. Murray had a similar bargain – Fish Pie – my goodness it was molten to start with. It smelt gorgeous, and was very fishy indeed. Almost healthy – and the fitness freak had water to accompany it. I was old-fashioned English, with a solid pint of bitter with it. Sometimes you can plan these things. We were away for a long weekend. A quick croissant for breakfast, then out doing touristy things in Devon. So, a pub lunch beckons? Yes, an idyllic Friday lunch – and as a working person, I still get a buzz out of having lunch out. It does feel sybaritic and rather naughty, don’t you think? But here’s the rub. We knew we were going to have a splendid Chinese banquet in the evening. Snack level for lunch – an obvious idea. I don’t know about you, but my normal working lunch tends to be sandwich based, and so the thought of a sandwich when you are “off” really does pale. Yes, you can go the soup route, and we were both considering that. But then the menu had something unusual on it at The East Dart Hotel, at Postbridge on Dartmoor. Three starters between us was a choice we have made before. But then we spied the children’s section which had the addendum “Children and for those with small appetites”. Whoopee! Result! And quite a choice. Chips featured widely, as you might expect, with fish fingers and beans, egg and beans (gosh, a vegetarian option! ), ham and egg, sausage and beans or peas and scampi. Washed down with a small glass of white or his or her own locally brewed east Dart Bitter (low percent and brewed for strong flavour), we really were onto a winner. They do an old-fashioned carvery with a choice of 3 meats or a nut roast, and a custard led pudding. Guess where we are going on Sunday?